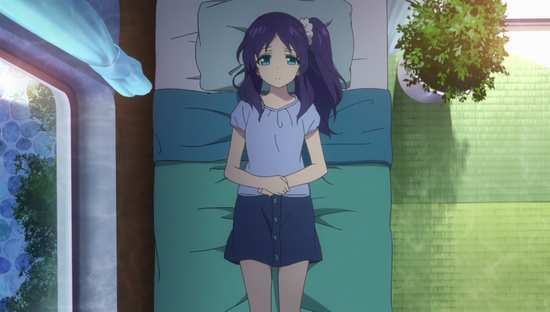 If you’ve read my reviews and know my preferences in anime, you might have been surprised last year when it was Stuart McLean who reviewed A Lull in the Sea. After all, a P.A. Works animation from the same people who created one of my favourite shows, Hanasaku Iroha, would be top of my list to devour, or in this case re-devour after having seen it on Crunchyroll. 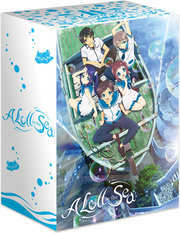 Truth be told, I had already purchased the Blu-ray Collector’s edition of A Lull in the Sea, a.k.a. 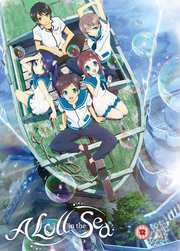 Nagi no Asukara on the day of release, and I’ve been lovingly gazing at the boxset ever since, wishing for the free time to get around to watching it. It’s only taken seven months. In my review for Hanasaku Iroha, you might remember my appreciation of the gorgeous art, the wonderful slice-of-life observations, the touching character drama, and indeed the wonderful characterisations, as well as the epic Collector’s Edition treatment that NISA gave the show. A Lull in the Sea builds on that experience by adding some interesting speculative fiction and alternate world-building. NISA also released the Collector’s Edition Blu-ray, and MVM have reworked that package for the UK, so you get the rigid artbox, the three Blu-ray discs, two soundtrack CDs, and a hardcover artbook as well. I have been so looking forward to this. We all know that life began in the sea, but in A Lull in the Sea, people came from the sea as well. Mankind evolved under the waves, but some left for the surface, choosing never to return, and thus losing their ability to breathe underwater. Now, two communities, both in decline, live uneasily side by side, surface dwellers and sea-dwellers. 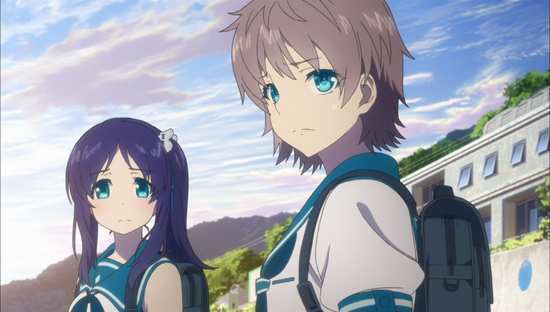 For Hikari, Manaka, Chisaki and Kaname, the decreasing population in their community means that by the time they reach the appropriate age, their middle school has closed down. The only solution is to transfer to the school on the surface. 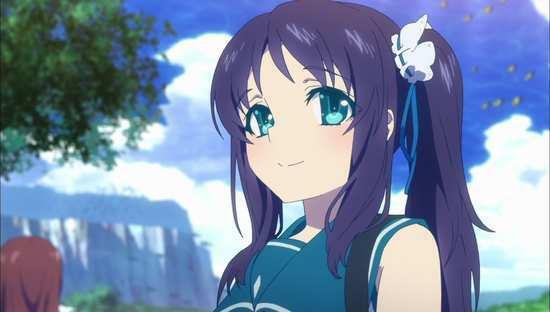 While the usual friction between different people is to be expected, it seems its worse making friends, especially when Manaka makes friends with a fisherman’s grandson named Tsumugu. They’re at that age when friendships turn into relationships, and that’s complicated enough without touching on the taboo on relationships between surface and sea-dwellers. 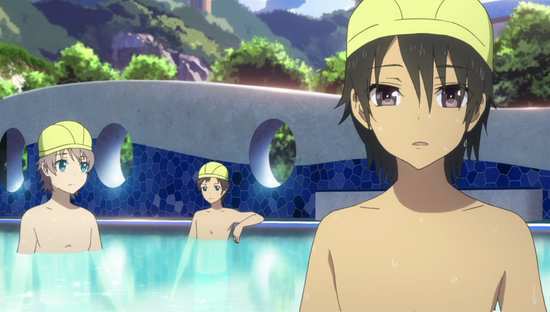 For Hikari that’s a more immediate issue, as his older sister Akari is in such a forbidden relationship herself. But there are far bigger changes coming to the world of the friends than mere puberty. 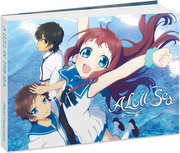 26 episodes of A Lull in the Sea are presented across three Blu-rays from MVM. 23. Who Do These Feelings Belong To? A Lull in the Sea gets an impeccable 1.78:1 widescreen 1080p transfer, at least to my eyes anyway. The image is clear and sharp throughout, the colours come across with consistency and vibrancy, detail levels are excellent, and I spotted neither compression artefacts nor digital banding. This is how I want all of my anime on Blu-ray to be. The transfer being this good is just what the show deserves, as Studio P.A. Works goes even further than they did with Hanasaku Iroha in creating a really special animation. The character designs are appealing and memorable, while conforming to modern anime styles, while the real joy in the animation comes from the effort put into the world design, especially effective when you have a contemporary, and recognisable, alternate surface world, and the slightly more fantastical realm of the undersea village. 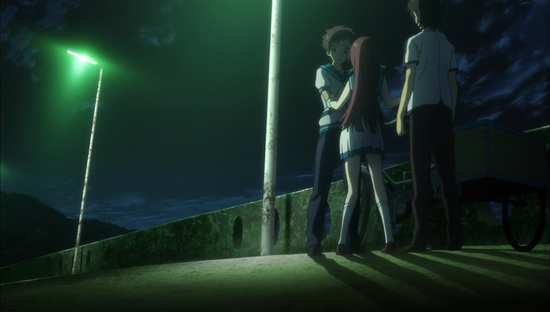 This is also a show that makes great use of lighting and similar effects to enhance the visuals. The world of A Lull in the Sea, while initially familiar, draws the viewer in, and tells a back-story of its own. This is a world that is winding down, on the decline, made apparent in the vehicles people drive, the technology they use, the sense that they re-use and recycle rather than buy new, and the fact that everything is running down, paint is flaking off all the signs and buildings, and there is the sense that things used to be more prosperous. The surface village has a significant sized dock that’s laid to waste, with small fishing trawlers all that venture forth, certainly no large container ships. There are also the pillars of an unfinished highway bridge slowly crumbling in the bay. There are plenty of little touches that add to the story and enrich the viewing experience. A Lull in the Sea gets PCM 2.0 English and Japanese audio, with optional translated subtitles and a signs only track, although you’ll have to choose with your remote rather than from the menu. 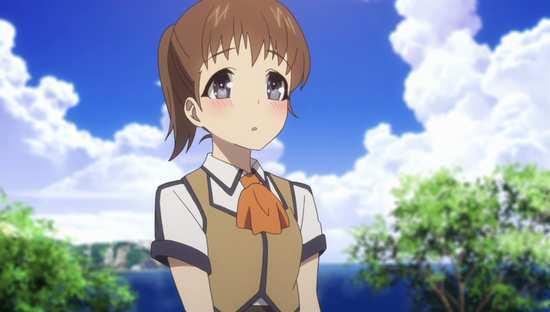 I gave the dub a try and it seemed pretty good, but the Japanese audio was always going to be my preference, especially with Kana Hanazawa playing the role of Manaka. 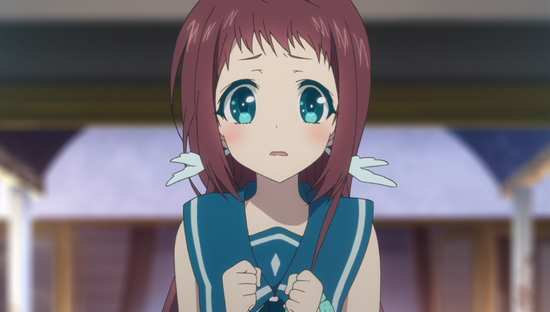 I just love the delivery when Manaka wakes up at the end of episode 20. The dialogue is clear throughout, the subtitles accurately timed and free of typographical error, and the stereo does enough to bring across the ambience and sound design of the show, especially in the underwater sequences. 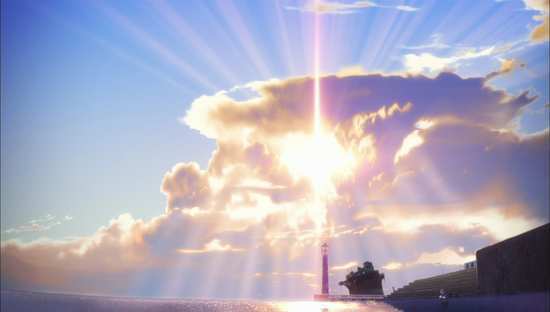 There is this undercurrent of foreboding in those scenes that grows as the series heads to the halfway point that is very effectively done, while past the time skip, the ocean scenes have this barren feeling, with the sound of breaking ice in the background that really works well. As you’ll see further down, A Lull in the Sea gets a great music soundtrack, some excellent theme songs, and incidental music that suit the story perfectly. The rigid artbox is quite snazzy, with some gorgeous character art on both sides. Of course with the BBFC logos, and the lack of glitter, it isn’t quite as snazzy as the US release, but it is essentially the same thing, the same content. That content is presented on three Blu-ray discs, which each get their own DVD sized Amaray case, no BBFC logos on the sleeve art, and with the sleeves reversible too, offering two times the character art for each case. The soundtrack CDs have to share an Amaray case, one disc on either face, but it too gets a reversible sleeve with even more gorgeous art from the show as well as the track listings, and inside you’ll find an insert with romanji and translated English lyrics for the songs. The 76-page hardcover book is bound landscape format, and as you might expect, it too is DVD Amaray sized to fit in the artbox. Once the Blu-rays detect that they are in a Region B player, they boot up with MVM, and Siren Visual logos to a gorgeous animated menu (The artwork in the show yields a cornucopia of riches when it comes to packaging and presentation). The episode listing seems simple and numerical at first, but pressing the right arrow button on an episode opens up the chapter listing and title. At the end of each disc, you get a few screens of English localisation credits. On disc 1 the sole extras are the first two textless credit sequences for the show. You’ll find the second set of textless credits on disc 2. There’s an alternative set of the second credit sequences on disc 3, two Original Japanese Trailers for Nagi no Asukara, and NISA trailers for The Eccentric Family, My Little Monster, and Chronicles of the Going Home Club. When it comes to soundtracks for movies and TV, for me a good one is one that you are pretty much unaware of while you watch the show, but comes to life when listen to it on CD without the visuals. Thankfully A Lull in the Sea’s soundtrack CDs, part of this collection are just that way. That’s aside from a few tracks on disc 1 which threaten an overabundance of acoustic guitar to the point of tedium. Things very much liven up after that. One disappointment, to be expected is that the theme songs on the CDs are the TV air versions, just 90 seconds in length. One would have hoped for the full length songs. The run-times and track counts for the discs are as follows. The book offers a decent amount of information for the show, with several pages of prop designs, background art, and art setting to take in. You also get character art along with short biographies for the characters, and in terms of text, the episode synopses are accompanied by commentaries on those episodes by the director and staff. All in all, the Premium Edition of A Lull in the Sea is a lush package. 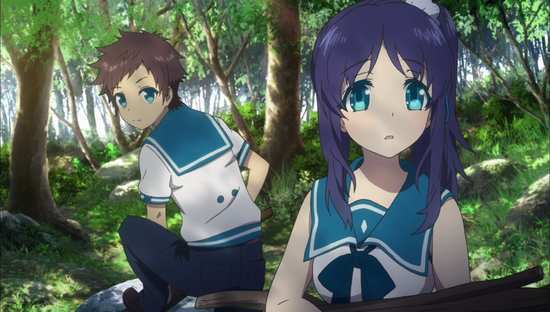 A Lull in the Sea is a surprisingly hard show to review without spoiling it. You wouldn’t think that of a show that on the surface looks like a typical slice-of-life, young teen romance show, but around the halfway point, there occurs a plot development so dramatic, that it completely changes the paradigm of the show, completely undoing any expectations that you might have built up to that point. It becomes hard to talk about how brilliant the show is without spoiling that event. And A Lull in the Sea is brilliant, one of my favourite shows. That isn’t surprising given that it comes from P.A. Works, as they do some great work when it comes to visual aesthetic and story development. In my recollection, A Lull in the Sea was second to Hanasaku Iroha when it comes to my appreciation of both shows. Hanasaku Iroha had the slice-of-life aspects down pat, and with great characterisations, but a comparatively mundane story. A Lull in the Sea on the other hand hits it out of the park with its story and especially its world-building. It’s a great example of speculative fiction in anime. 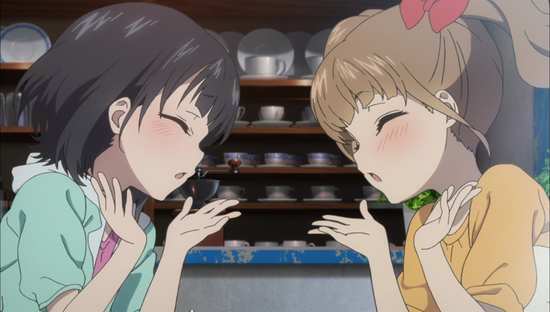 The slice-of-life aspects were almost as good, but the first time around on Crunchyroll, I felt that the characterisations were a little more generic and not quite as nuanced or quirky as in Hanasaku Iroha. That’s still the case, but watching the show on Blu-ray, able to take in the gorgeous artwork, and appreciate the story on a marathon basis, A Lull in the Sea really has improved in my estimation. It’s a compelling and moving romance fantasy, and it is up there with Hanasaku Iroha as some of the best anime that P.A. Works has put out. Initially it seems so mundane, following the novelty of being presented with two worlds, the undersea and the surface worlds living side by side. There’s little to differentiate the two in appearance, other than fish swimming around the undersea world. 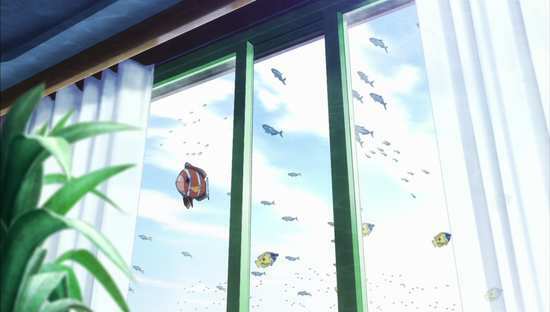 The animators chose not to opt for realism when it came to things like buoyancy, and instead kept things pretty much like the surface for the inhabitants of Shioshishio. They can even cook with the aid of a sacred flame that burns blue underwater. The real differences are in the way the societies relate to each other, with friction, distrust, and even petty bigotry. So when it comes to four young students from the undersea village starting school on the surface, there is the expected touchiness and raw nerves on both sides. On the other hand, there is also distrust at too much fraternisation, when it becomes clear that romantic relationships between the sea-dwellers and surface dwellers are taboo, and with good reason. It seems that children born of such relationships lack the Ena, the second skin that allows people to breathe and live underwater, so by going to the surface to marry, the population of the undersea village is on an inevitable decline. Of course for Hikari, Manaka, Kaname, and Chisaki, things aren’t quite so philosophical. Hikari’s the brash, impulsive type who dotes on Manaka. She’s cute, but ditzy, and has ever been the baby of the group, despite the fact that they are the same age, but she too has a hard-headed streak. Kaname’s more the reserved and quiet type, a good balance for Hikari, while Chisaki’s the older sister type of the group, a little more mature and level-headed, but in certain respects shy. The mathematics might be right, but relationships are never that simple. 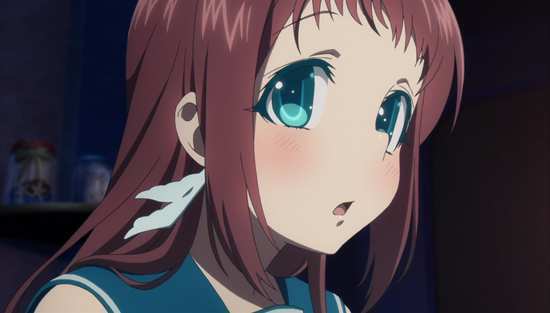 Hikari obviously adores Manaka, and it seems the feelings are mutual, but Chisaki likes Hikari too, which makes Manaka feel guilty, and then Kaname likes Chisaki. And with the usual teenage inability to communicate, it becomes this constant dynamic of happy angst. 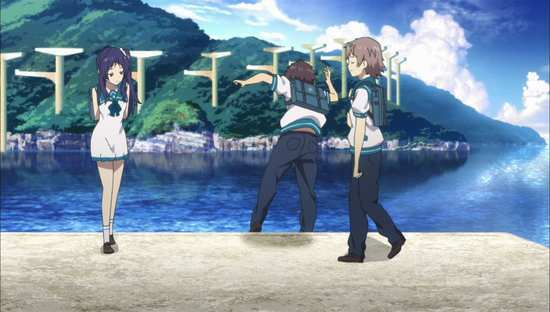 Except things get more complicated on the way to school on their first day, when Manaka is ‘caught’ by fisherman’s grandson Tsumugu, and another potential boyfriend appears. 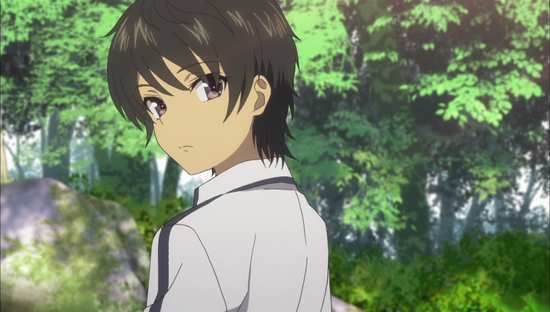 He’s mysterious but passionate, and Manaka hits it off with him straight away, which invokes no little jealousy in Hikari. It’s made worse because Tsumugu is a surface dweller, and it’s made even worse as he’s also a nice guy. The story unfolds in the first half, much as you would expect from a slice-of-life, young teen romance, with a fair bit of light comedy, some drama, and a general warm feeling. 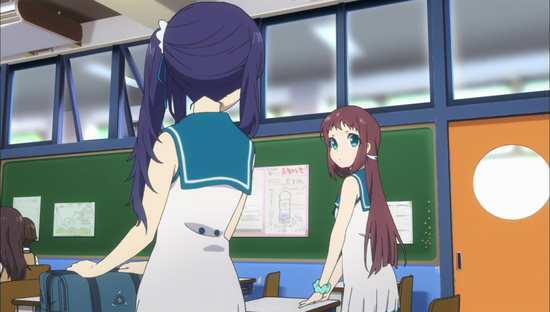 The big drama comes from Hikari’s sister, Akari, who is in a taboo romance with a surface dweller, which causes strife for the family, and raises vocal objections in the undersea village. The man she’s in love with has a young daughter from a previous marriage, also with a sea-dweller, and that adds to the drama. 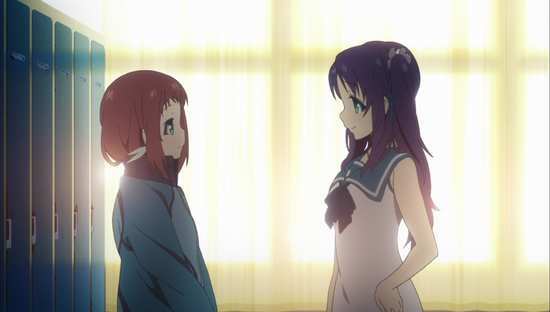 Akari gets disapproval from below, while young Miuna, who’s fond of Akari, doesn’t want her ‘replacing’ her mother, and starts looking for a way to break her and her father up. 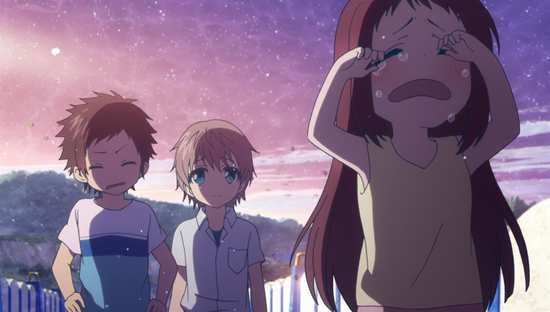 She and her friend Sayu are elementary school kids, but get involved with Hikari and his friends as he’s Akari’s little brother. 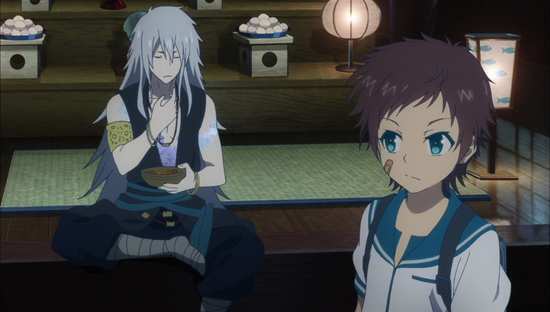 Hikari has to choose between tradition, and his sister, and how he chooses also affects how he sees Manaka’s growing friendship with Tsumugu. 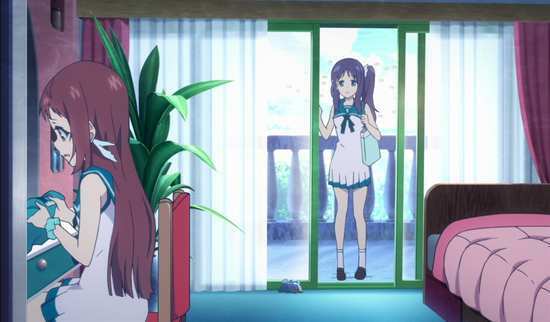 So the show progresses in its first half, seemingly mundane, focusing on character drama and light comedy, and generally invoking warm feelings in the viewer. But in the background, there are hints and clues to major changes coming to the world, ominous changes that don’t bode well, and they slowly become more obvious and more imperative to deal with. The answer it seems would be tradition, but the friction between the two communities means that the tradition is no longer observed, a festival where a ‘doll’ is sacrificed to the sea, recreating the events of an ancient legend. It falls down to the children to revisit the tradition, and through sheer dint of effort persuade the adults of both communities to come together and follow it as well. But things do not go according to plan. It’s here, at episode 14 that we enter serious spoiler territory. I think it’s safe to confirm that there is a time-skip, and that we catch up with the characters five years later. And it also becomes apparent that the fate of their world is in some way connected to their feelings, feelings that they have to understand and resolve. It’s such a fantastic development to the show, a masterstroke of narrative that it makes you completely re-evaluate the story, and you come to realise that it’s far more than teen angst in a fantasy world. A Lull in the Sea is built on ideas of faith, of mythology, and of human nature, and has much greater philosophical underpinnings than any mere light comedy drama would have. As such, it becomes a far more effective and memorable a show, very much a classic anime for the future. If there’s one thing that any viewer can expect from A Lull in the Sea, it’s happy tears. A show this good deserves the best presentation, and MVM’s Collector’s Edition is just the ticket. The Blu-ray is one of the best anime releases I have seen, the packaging is perfect, the soundtrack CDs are excellent, and the collector’s artbook is full of information and beautiful imagery. Given some deluxe releases I have seen which come with added disposable tat (stickers, temporary tattoos, and postcards), this is what Collector’s Editions should aim to be. I love the packaging / extra stuff. Now that so much is available digitally I feel sure that this is the future of physical media, hence the popularity of steelbooks etc.